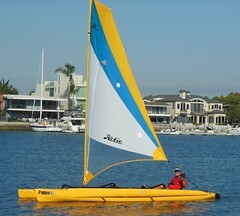 7 Hobie Island club members got together at San Diego's Lake Hodges. This group is called the Flying H Island Club and is organized by Bruce Damon of Nomad Ventures of Escondido. Lorraine Garnier at Hobie Island Clubs is helping the Southern California island clubs work together to create a calendar of events so that we can meet and get to know and share the fun with other island owners - its working ! We all had a great time and soaked up the 80 degree warmth. Winds were light with a few stronger gusts. Lake Hodges is renown for its ability to turn on strong winds as they funnel down through the canyons and across the lake. This is one of the few place in San Diego you can find strong sailing winds. the photos in the video were taken by Bill Wickersham - thanks Bill ! Looks like a great day of sailing. Sorry I missed it. Had to choose between riding the Goldwings to Palm Springs or Lake Hodges sailing and the wife likes when we take both bikes and ride together. Next time sailing wins. What a great spot for some racing, testing and Hobie novelty events like racing around a coarse with sail but without outriggers. Nice video Aussie. Otherwise known as upside down racing, or swimming? I tried my TI on the water with mast up but no ama's in very very light winds. It was hard to keep it upright even with the sail furled, the mast just provided such a long lever. Like a bathtub out there! You never got wet. Would like to have some of that. Great place to practice capsize and righting. Great shot under the folding Hakas.